[caption id="attachment_27757" align="alignleft" width="640"] Pauline Jean. All photos by Sharonne Cohen[/caption] "In Haïti, everything that seems difficult in modern countries [getting someone to lend a helping hand] is easier, whereas everything that is simple in modern countries [water, electricity, democracy] is very complicated. "—Dominique Wagner, local driver While Haïti shows signs of recovery following the devastating earthquake of 2010, six years later there is much rebuilding yet to be done. Still the most impoverished country in the region, Haïti's economy has been slow to recover. In Port-au-Prince, construction is everywhere; mounds of rubble are still visible throughout the city, and many structures are still dangerously unsafe. Some roads remain unpaved, others have no street lights, and there are hardly any traffic lights. And yet the city is bursting with vitality, color and sound, vendors displaying everything from fresh produce to furniture to cellphone covers to street food, cooked right there on the spot. The busy, labyrinthine streets are filled with all types of vehicles, including ornate, brightly-colored tap taps (literally "quick quick")—shared taxis which are actually customized pickup trucks, individual creations of their owners, expressing themselves through their choice of color, decoration, slogan. And then there's the politics. An undecided first round of elections last October (claimed by critics to be fraudulent) ignited a flammable political situation which has yet to be resolved, meaning Haïti—the first independent nation in the Caribbean—was unable to elect a new president before the term of Michel Martelly (A.K.A. konpa singer Sweet Micky) ended on Feb. 7. 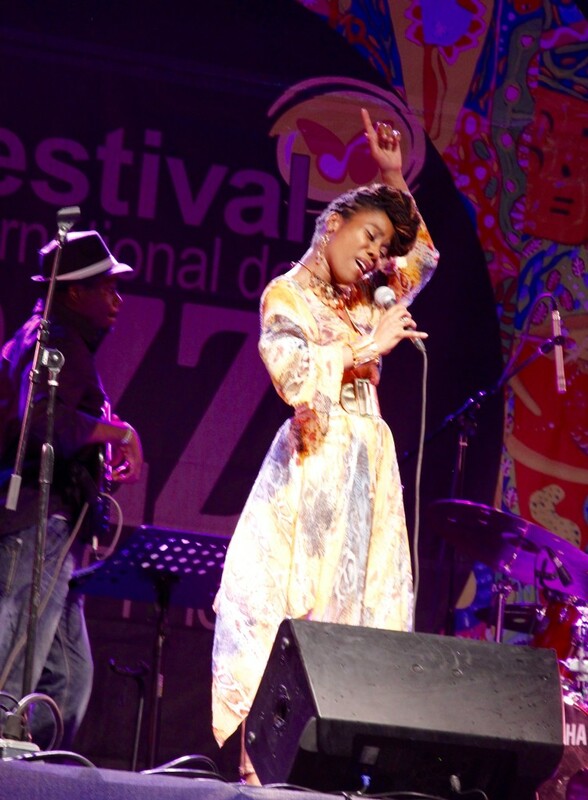 Set to open following weeks of social and political unrest, the Festival International de Jazz de Port-au-Prince celebrated its 10th anniversary Jan. 23-30. Almost miraculously, this special edition took place even as the streets were filled with demonstrators and burning tires, the heated climate wreaking havoc on the festival's programming and logistics. 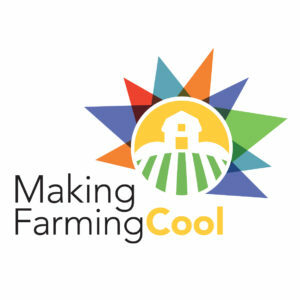 A second round of elections was postponed, then postponed once again to the festival's opening weekend, causing daily challenges: concert cancellations (including the opening night performance of American saxophonist Kenny Garrett, and closing concert by popular Brazilian vocalist Elian Elias), venue changes, attendance and safety concerns. But none of this was enough to stall the festival; its team, led by Joël Widmaier and Milena Sandler, hustled to find solutions that would enable the musicians who came from far and wide to play, and allow audiences to enjoy the music. And so, despite it all, each of the festival's seven nights delivered a variety of exciting music, performed in various venues around the city. Offering 70 percent of the concerts to the public free of charge, the festival partnered with Université Quisqueya (the native Taíno name for the island), featuring many of its concerts on the university's new campus (the previous one destroyed during the quake), as well as Place Boyer. The festival also offered workshops and late-night jam sessions, presented at three venues—Quartier Latin, Presse Café and Yanvalu—offering performers the opportunity to play together in various constellations, sharing the stage with many of the city's talented musicians as well. Shades of Kreyòl Jazz The festival offered a platform for Haitian artists to showcase their unique brands of kreyòl (Creole) jazz, kicking off with the compelling Haitian All-Star Jazz Band who performed on opening night. Conceived by Joël Widmaier as a band that would unite the best jazz musicians from the Haitian diaspora, the group consisted principally of Haitian-American artists who grew up in the U.S. but are nonetheless immersed in the culture and music of their roots: vocalist, composer and arranger Pauline Jean, set to release her kreyòl-infused recording Nwayo in May (Jean performed a set of her own several nights later, captivating the audience with her commanding vocals and strong stage presence); master drummer Obed Calvaire, who offered a workshop to over 25 drummers, supplying sticks to all participants; trumpeter Jean Caze, whose recently released Amédé is imbued with Haitian rhythms and melodies (Caze played with several other bands during the festival, including local konpa outfit Mizik Mizik); alto saxophonist Godwin Louis, who lived in Haïti for several years in the 1990s, and maintains a strong connection through frequent trips, visiting family and researching Haitian rhythms (stay tuned for his upcoming recording); and bassist Jonathan Michel, a sideman on both Godwin Louis' and Pauline Jean's albums, whose own forthcoming project includes the tune "L'Ouverture"—referencing both the leader of the Haitian Revolution, and the title's literal meaning (The Opening), implying "an opening for those outside the culture to experience the music and stories of the Haitian people, and for those who are from the 'motherland' but are physically away to keep Haïti in their hearts, minds and actions." [caption id="attachment_27762" align="alignleft" width="640"] Godwin Louis with the John Bern Thomas Group[/caption] The All-Star band also featured local musicians Mushy Widmaier (keyboards), John Bern Thomas (drums) and Joël Widmaier (percussion)—all of whom played in various other groups throughout the festival—as well as guests including saxophonist David Sanchez, who was in Haïti exploring the percussion-driven musical traditions shared by Haïti and his native Puerto Rico. "We had no rehearsal time; it was all in-the-moment," said Calvaire. "There was chemistry in the air. We were like a team." 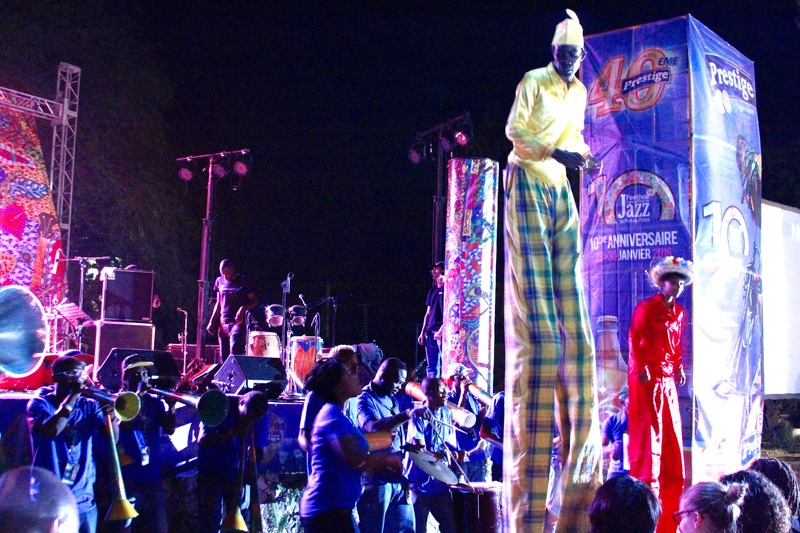 Showcasing the thriving music scene in Port-au-Prince, the festival highlighted numerous other local musicians. Classically trained Haitian-American bassist-composer Jaël Auguste, who has moved back to Haïti and is in the midst of developing a new sound he refers to as "Voodoo Funk Fusion" shared with the audience at Quartier Latin. Drummer Ruddy Nau, son of drummer Herman Nau of the legendary Tabou Combo, led the late-night jam on opening night, while aforementioned drummer John Bern Thomas, a prodigy and 2012 OneBeat Fellow who has played with musicians across Haïti and around the world, accompanied several of the headliners as well as leading his own group and shining during the festival's jam sessions. 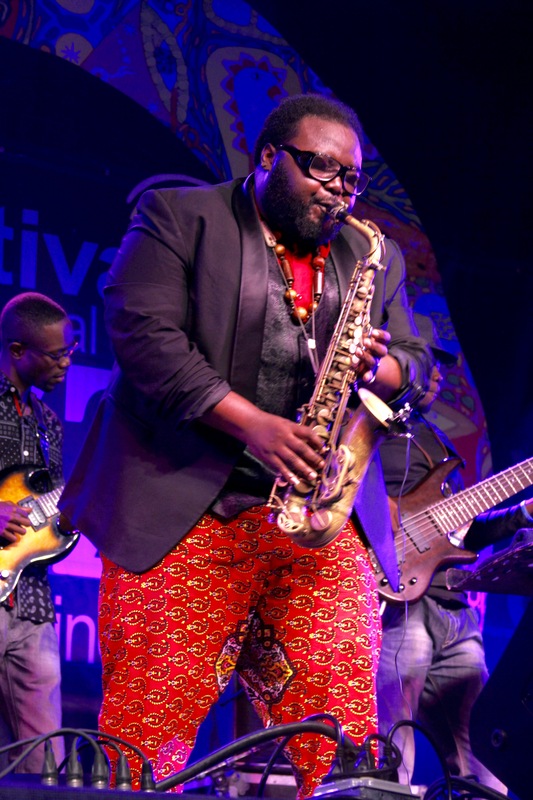 Having studied the different styles of Haitian music as well as jazz and other genres, Thomas' set included his arrangement of Wayne Shorter's "Footprints," Hermeto Pascoal's "Ginga Carioca" and traditional Haitian classics ("Minis Azaka"). [caption id="attachment_27758" align="alignnone" width="640"] Jam session at Presse Café. 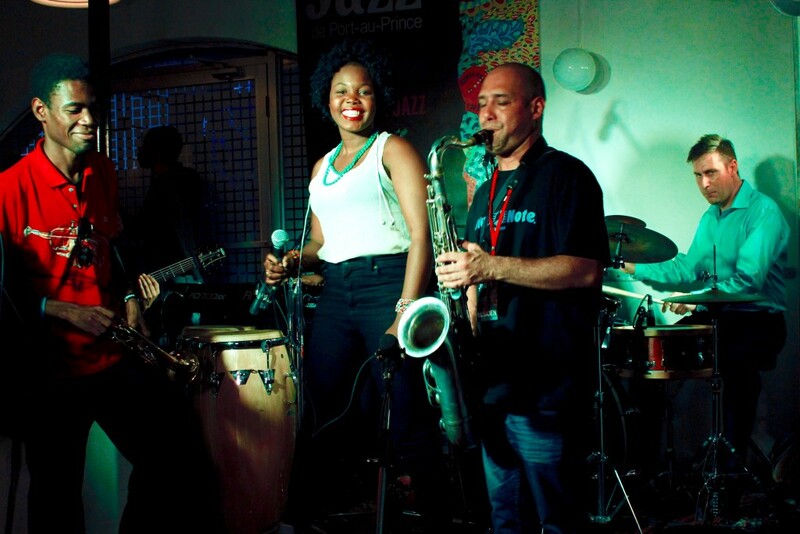 From left: Amazan Audoine, Alexandra Cherrelus, Augustin Moya, Jim Doxas[/caption] Promising young vocalist Alexandra Cherrelus performed with Project Chameleon (leader and bass player Gerald Kébreau, pianist Josué Alexis and drummer Norman "Poupy" Iméran), as well as the jam sessions. 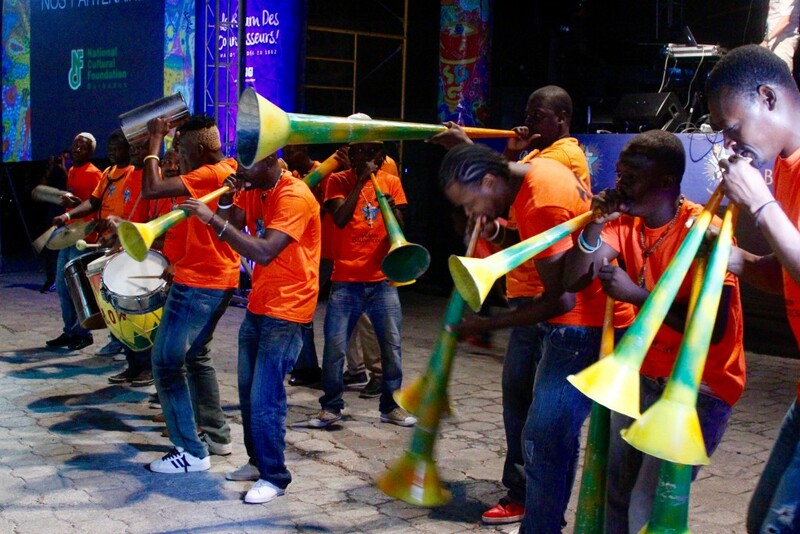 Follow Jah—a spirited 17-piece bande à pied (marching band) based in Pétionville, featuring traditional horns, percussion, song and dance—brought audiences to their feet during intermissions at both outdoor venues. Bands such as these traditionally play at specific times of the year, including Carnival and Easter Week, in what is called rara—"the first native tradition of Haiti" (UNESCO). The genre is said to be rooted in the 1700s, when French colonization was still in place and African-Haitian sugar plantation slaves began seeking independence both politically and culturally—through music and art. The musicians are joined by neighbors and supporters, marching through the streets and singing traditional songs in a progressively growing parade characterized by the seductive, distinctive sound of bamboo horns (vaksin), tin horns (konet) and various percussive instruments. Follow Jah certainly captured that rara spirit, with its hypnotic sound and infectious energy. [caption id="attachment_27766" align="alignleft" width="640"] Follow Jah marching band[/caption] A final dose of kreyòl jazz was offered on closing night, with a performance by the pan-Caribbean band Wèspè Pou Ayiti (Respect For Haïti). Conceived by Saint Lucian pianist Richard Payne as "a way to shine the spotlight on Haïti and its artists, who were suffering incredible hardships in the wake of the earthquake," the band became the collaborative effort of a group of Caribbean musicians, all showing support for the devastated nation during its time of need, and honoring its contribution to Caribbean art, culture and history. Very much a regionalist, Payne feels that the Caribbean is really one space, separated only by water. "So many things unite us culturally—the Creole language, food, music, a sense of brotherhood, a sense of responsibility to do what the politicians are not doing—seeing themselves as one," he says. 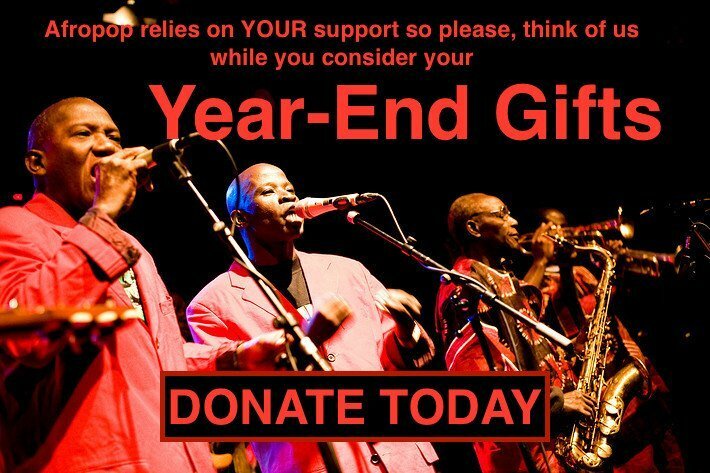 The band—aforementioned trumpeter Jean Caze, Saint Lucian bassist Francis John, Martinique percussionist Miki Télèphe, Guadeloupian drummer Gregory Louis (who replaced countryman Sonny Troupé) and Haitian percussionist Joël Widmaier—has come together on several occasions, performing at various Caribbean festivals. Although all the musicians are busy with their respective projects, and while preparing for concerts is no easy task, as the musicians live on different islands, unable to rehearse, they are all committed to the band and its raison d'etre. The music itself reflects this pledge of solidarity; a set played at Parc Historique de la Canne à Sucre included Caze's hopeful "Haitian Peace Song" and Payne's haunting "Citadel"—referencing the large mountaintop fortress built in northern Haïti after it gained independence from France at the beginning of the 19th century—"a seminal moment in our history, which began a path to nationhood for the entire Caribbean archipelago" and an inspiring symbol for its author, representing audacity and confidence. The jubilant "Mockojumbi" alludes to the Caribbean tradition of stiltwalkers and dancers, colorfully dressed and donning carnival masks. Thought to originate in West Africa, it is a celebration of Carnival, marked in different ways throughout the Caribbean while sharing a common musical thread, interweaving calypso, rara, Latin American music and jazz. With performances scheduled in the Dominican Republic, Guadeloupe and Martinique later this year, one hopes the band finds more opportunities to share its music and message outside the Caribbean as well. [caption id="attachment_27767" align="alignnone" width="640"] Rara performance with Follow Jah and Mockojumbi[/caption] World Beats The festival featured concerts by a range of international jazz artists from 15 countries, including legendary Canadian pianist Oliver Jones; these were made possible through the support of the artists' respective embassies (the festival is also backed by the Haitian Ministry of Culture and Tourism, and international corporate sponsors). The outstanding Cor des Alpes was particularly worth mentioning. This European-African band—leader and trombonist/alphorn player Pascal Schaer (Switzerland), countryman trumpeter Ian Gordon-Lennox, bassist Olabissi Kpota (Benin), guitarist Cyril Moulas (France), and percussionists Baba Konate (Burkina Faso), together with special guest percussionist-vocalist Jah Baba (Benin)—played two powerful outdoor concerts traversing jazz and West African music that swept away audiences. 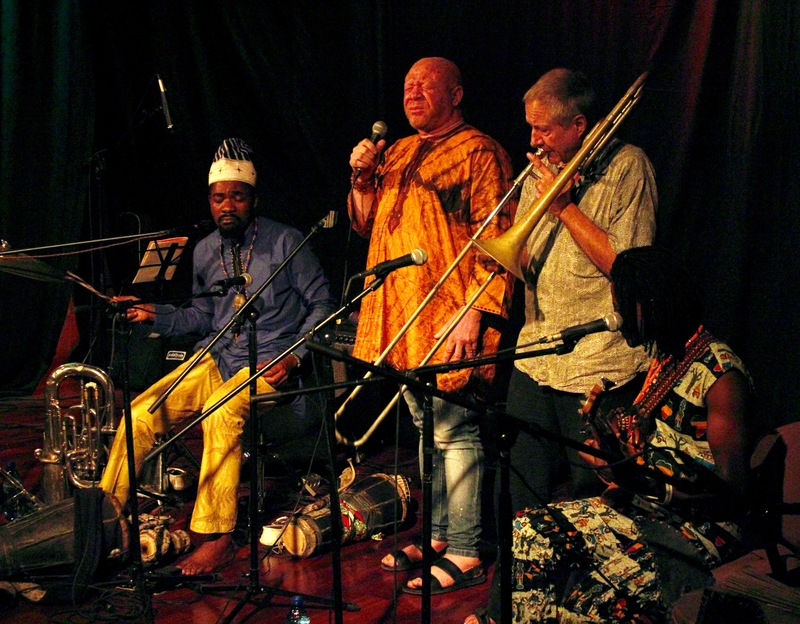 The music included "Rendez-vous Encore," the new "Fantasie Haïtienne" and the sweeping "Blues for Ali"—homage to legendary Malian guitarist Ali Farka Touré. 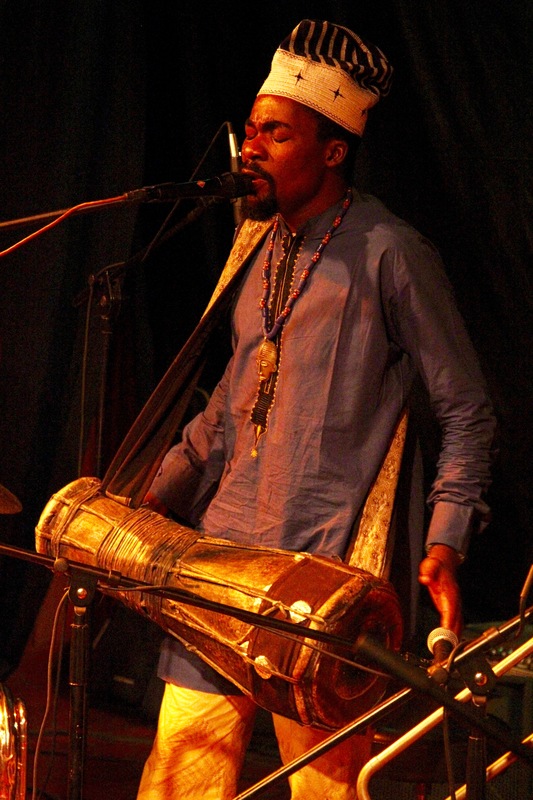 [caption id="attachment_27761" align="alignleft" width="200"] Jah Baba[/caption] Jah Baba (born Oladipo Abiala) offered an intimate, poignant concert at Centre Culturel Fokal, singing and playing gangan (talking drum) and other percussion instruments, as well as euphonium. With guest personnel from Cor des Alpes, the set included original songs based on traditional rhythms such as "Amanma Yova" (whose title refers to the fact that we all come into the world naked—with nothing—and so will return to the earth). 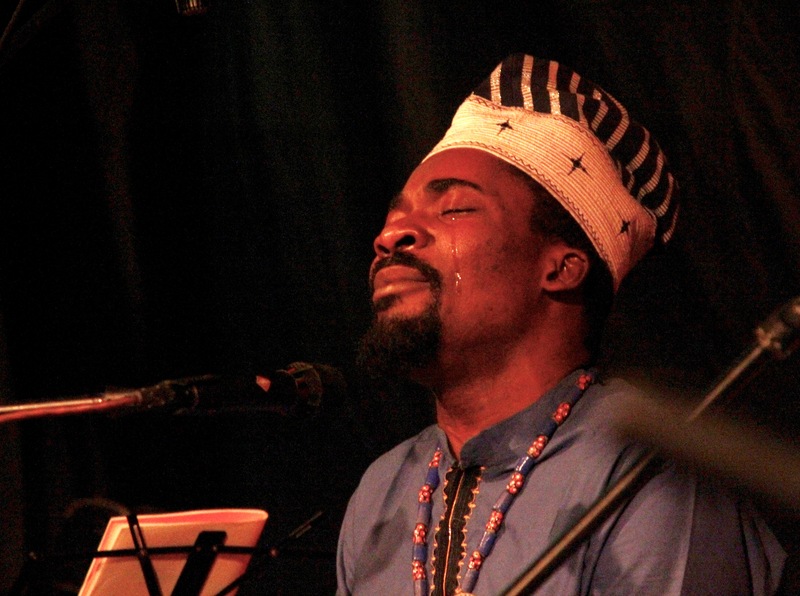 "That song is about the death and injustice in the world," explained Jah Baba during our interview. "Many people are dying because they don't have food, a home or healthcare, while many others enjoy spending a lot of money taking care of their dogs. . . But we will all die and all end up in a grave. We have to keep that in mind, and try to do better." Inviting Haitian singer James Germain to the stage, the two shared a special moment performing "Asso." 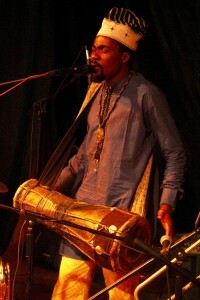 Consciously expressing all aspects of the Yoruba tradition (the bata drum, the language, traditional clothing) from which he draws his inspiration, Jah Baba has the deep sense that it his mission to help redress social injustice, "to let people know that the most important thing in life is not yourself, but sharing." [caption id="attachment_27759" align="alignleft" width="640"] From left, Jah Baba, with James Germain, Pascal Schaer and Olabissi Kpota[/caption] Haïti—or Ayiti, as it is pronounced on the island—may be one of the most colorful, lively, creative and mystifying places you'll ever have the good fortune to visit. "Politics are everywhere; but we musicians, painters and dancers of Haïti suffer too often from our country's instability. We just want to do our thing; we just want to express ourselves without having to choose sides," said bassist Jaël August as we chatted pre-show at Quarter Latin. Still embroiled in political turmoil (with a temporary president, transitional government, and new elections scheduled for April 24), Haitians are extremely suspicious of the process and the political elite. This festival—through its musical offerings from around the world, the platform it offers local artists to showcase their music, and the (mostly) free access it affords the people to enjoy this music—surely had some part in lifting spirits and feeding souls during troubled times. Thank you to Claude Thibault of sortiesJAZZnights.com for live footage from the festival. Sharonne Cohen is a Montreal-based writer and editor. She has been writing about music and culture since 2003, her work published in JazzTimes, DownBeat, The Revivalist, La Scena Musicale, Rover Arts and other publications.